Welcome aboard the historic Red and White FleetSM- San Francisco's original sightseeing adventure and only multilingual bay cruise! In operation since 1892, our family-owned fleet provides unique bay cruises from Pier 43½ in the heart of Fisherman's Wharf. Our cruise tours of San Francisco Bay take visitors to San Francisco's biggest landmarks and premier attractions, including the beautiful Golden Gate Bridge and around notorious Alcatraz Island. Red and White'sSM boat cruises of San Francisco Bay not only are spectacular, but also a convenient way for visitors to discover the many famous sights of the City by the Bay in a relaxing and classic way. After all, our boat tours of San Francisco Bay depart up to 17 times daily from Fisherman's Wharf, feature indoor and outdoor seating, and have cash bars onboard. Plus, our daytime cruises include exclusive headphone audio in 12 languages, giving you the option to learn about San Francisco history and sights, or to simply kick back and enjoy the amazing views. Don't let your visit pass without taking a SF Bay cruise aboard the Red and WhiteSM, the original San Francisco tour provider. For more than 120 years, Red and WhiteSM has offered visitors and residents a variety of special SF Bay cruises, such as sunset journeys, bridge-to-bridge tours and more. We look forward to sharing our hometown also with you! With our 1-hour Golden Gate Bay CruiseSM, San Francisco visitors can enjoy stunning views of the Bay and Alcatraz without ever having to leave the ship. The Golden Gate Bay Cruise is a true San Francisco original and is accompanied by insightful headphone narration available in 12 language options. 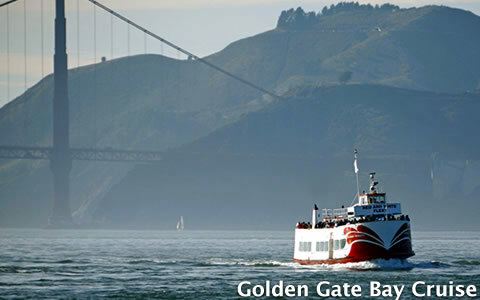 The Golden Gate Bay Cruise is offered 8-12 times daily starting at 10am. The new 90-minute Bridge 2 Bridge CruiseSM, the latest addition to our line-up of San Francisco Bay tours, is an amazing way to celebrate the 75-year anniversary of the Golden Gate Bridge as well as the incredible San Francisco Bay Bridge on a spectacular sail along the entire San Francisco waterfront. The headphone audio focuses on the famous San Francisco bridges, bay area geology and earthquake proofing of the city's famous structures. Of course, this audio tour is also included in the price of your Fisherman's Wharf cruise! As an alternative to our daytime sightseeing cruises, enjoy sunset and twilight views when sailing San Francisco Bay aboard our relaxed 2-hour California Sunset CruiseSM from Spring to Fall, or the California Twilight CruiseSM in winter. Included in the price of our evening tours are hearty appetizers from the buffet, a beer, wine or soda, and live guitar music, giving you a perfect opportunity to end your day while sharing drinks with friends aboard the boat in a casual atmosphere. Along the way, check out the stunning beauty of the San Francisco skyline, as you sail past Alcatraz Island, the Golden Gate Bridge, Angel Island, and the charming towns of Tiburon, Sausalito and Belvedere, where breath-taking mansions line the steep cliffs of Richardson Bay. Our knowledge of the San Francisco Bay area is unsurpassed by other tour companies - Red and WhiteSM is the original guide of all San Francisco Bay cruises. But we don't just offer bay cruises. Once you've seen San Francisco from the bay, join us for a hop-on hop-off bus tour and many other land-based adventures. Click here to see our video.